Twitter is a fun and quick way to express one’s opinion. It also is a very powerful and potentially dangerous tool. In fact, it could possibly get one’s college admissions revoked, and impact the way hiring companies view that person. A survey performed in 2009 by the National Association for College Admissions Counseling showed that 88 percent of admissions officers believed that social networking sites were either somewhat important or very important to their current and future recruitment efforts. This means social networking sites such as Facebook, Twitter, and Tumblr could have a negative impact on admissions to colleges for Seaholm students. “Although admission counselors may not check specifically each student’s profiles or blogs, it is best to follow these guidelines given the open and accessible nature of the internet,” Seaholm college and career center instructor Judith Stahl said. 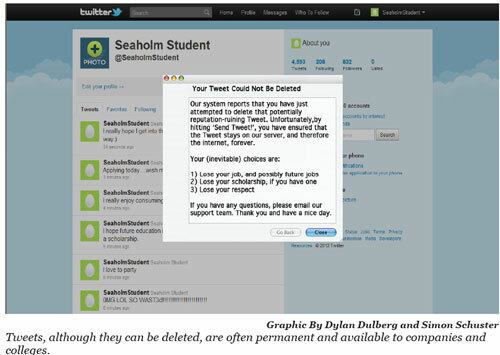 A survey of Seaholm students who used Twitter showed that 60 percent of students had deleted at least one tweet, of which 60 percent of students said were deleted because they were offensive or inappropriate. Of the 50 students who admitted to deleting at least one tweet, 72 percent of them said the motive behind the tweet was humor or on the spur of the moment. Even if it is light hearted or sarcastic, students should still be careful about what they tweet. As it can be a repellent to companies looking to hire. The reason this is a problem for young adults is, unlike accomplished professionals who utilize social networking to promote a positive image, they use it as a source of entertainment. With the development of technology and social networking, more and more companies are becoming sensitive to the activities done by potential employees. According to Reputations.com, a recent poll showed that approximately 80 percent of recruiting professionals incorporate online reputation research into their hiring process, and that 70 percent of those companies have rejected an applicant due to something they found online. However, there are ways to avoid getting in trouble because of social media. In some cases, students can actually improve their chances of getting accepted by colleges and getting a job after college. Still, profiles on Facebook, Twitter, and other social networking sites should be monitored and used carefully. At the same time, students should be aware and carefully select their usernames and what basic information is shown to the general public, even if they cannot access the whole page. To Seaholm students that use Twitter and other social networking sites, Stahl has a couple words of advice.